The magazine publication “Construction In Focus” recently covered the progress and ideology of Sewer Equipment as a whole in August of 2018. 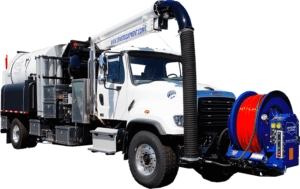 Focusing on simplicity and innovative solutions over all the complex bells and whistles the rest of the industry goes for, Sewer Equipment operates using outside-the-box thinking to solve complex problems, and has been doing so for quite some time. The Model 900’s Hydro Drive is further proof of Sewer Equipment’s dedication to innovation. Check out more pictures of the Model 900 ECO here! But Sewer Equipment isn’t finished. Madole finished by adding that Sewer Equipment plans to continue “maintaining our tradition of commitment to innovation through common sense solutions in the interest of growth, success, and the continued satisfaction of customers. You can read Construction in Focus’s full article here. Additionally, you can read more articles like this here.